It looks like we'll get a chance to hear a new Okkervil River LP next month. It's been just about a year since I was in Maine trying to locate The Stage Names at a crappy Strawberries Music store. Just for the record, they didn't have the album and if they did it would have cost $18. No, I had to travel 45 miles to a Bull Moose Music. But I digress, because now I am in Austin, home to Okkervil River...sort of. I actually read that Sheff and Co. are spending their off-time in the post-millenial Seattle aka Brooklyn. Don't worry hipsters Brooklyn is safe for skinny jeans and guyliner. 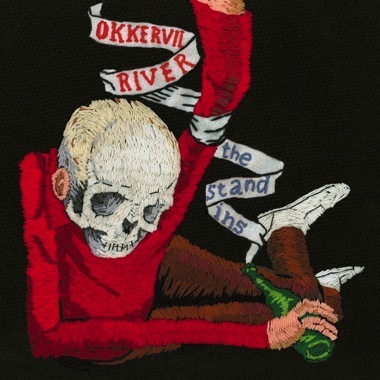 In any case, I'm pretty psyched about a new Okkervil River disc. It's due out on September 9th and the band is due to appear here in Austin for the Austin City Limits Fest. It hasn't been confirmed but they are also rumored to be appearing at Stubb's on the Saturday night of ACL for an after-party with the Black Keys AND the Black Angels. For those of you who aren't already familiar with Okkervil River, they do dramatic, folk/indie pop. There songs are quite literate like the Decemberists with lots of stringy, harmonious arrangements ala Arcade Fire. Here's some video and Mp3's from earlier releases. All links courtesy of JagJaguar, the bands official label. Here's a video for Our Life is Not a Movie or Maybe in .MOV format. By the way if you want to catch Okkervil live you can check their tourdates here. Last minute update. Apparanently the Okkervil River ACL aftershow is happening at Emo's with Man Man and Crooked Fingers. The Black Angels, Black Keys show will be at Stubb's..still.